Today we are happy to host author Talia Aikens-Nunez, author of OMG...Am I A Witch?!. Talia is here to talk about her favorite television shows for the fall season. Welcome, Talia! (1) The Blacklist- I just love to hate yet try to figure out Red. Is he a bad guy or a good guy? Is he Lizzy’s father? Ah! The questions just keep coming. And, really what’s up with her husband? (2) The Big Bang Theory- This is the smartest comedy on TV. Just about every episode has me laughing until tears are streaming down my face. No wonder they get paid a whopping $1 million per episode! (3) The Biggest Loser- This show makes me cry in a different way. It makes me want to use my elliptical again instead of using it as a place to dry clothes. It makes me want to lose the weight I gained from my kids and be healthier. This is my feel good show. (4) Scandal- Trash TV at its best. Nothing says trash TV better than marital affairs, murder and politics. And, the cherry on top is that the acting is great! This is the kind of show where you pop the popcorn and stare at the tv for an hour. (5) Parenthood- I’m tearing up as I write this, not because of the topics, even though two seasons ago I cried every episode, remember Christina’s cancer?? But, I am tearing up because it is the last season of Parenthood. I am going to SO miss the Braverman Family!! About OMG...Am I A Witch?! 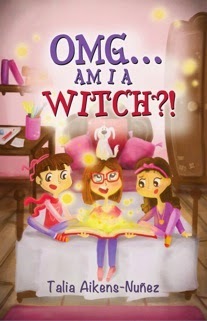 Enter to win a free copy of OMG...Am I A Witch?! HERE. I love comedies so I'm so with you on Big Bang. I'm loving all the romantic comedies this season like Selfie and Manhattan Love Story.